1. Place the screw-nut onto the ball joint. 2. Push the ball joint into the circular clamping slot. 3. Clip the phone holder onto your air vent or stick the 3M tape on any place of the dashboard. 4. Adjust the angle to your best view. 5: Put the mobile phone in for using, no need other operation. 1. Take off phone case, metal ring holder, metal attachments and bank cards, for optimal charging. 2. Protective cases exceeds 0.11''(3MM) thickness might hinder wireless charging performance. wireless car charger wireless charger car mount wireless phone car charger. 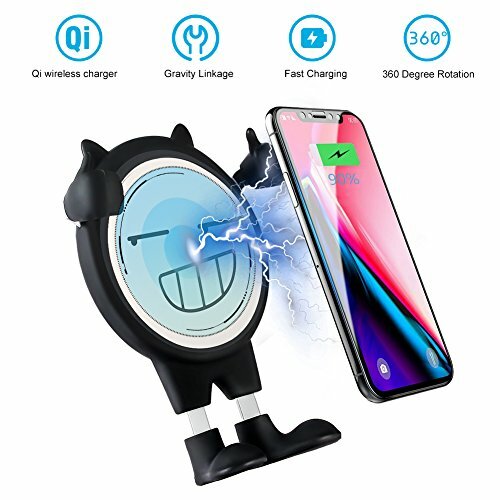 【Unique Design】Our car wireless charger resembles an adorable cartoon figure,you could barely find any similarities on the market! Made of ABS and Silicone,protecting your phone from getting scratches. Built-in intelligent chips provide over-current protection, short circuit protection, over temperature protection, making sure ultimate safety for your phone. 【10W Qi Wireless Car Charger】Reliable 10W charging experience, up to 50% faster than the standard charger. This wireless charger car mount support fast charging mode such as Samsung Galaxy S8, S8 Plus, S8 Note, S7, S7 edge, S6 Edge Plus and Note 5. Compatible with iPhone X, iPhone 8, iPhone 8 Plus Nokia 9 Nexus 4 5 Lumia 920 and more at regular speed. NOTE-Make sure that phone's back is not attached with any iron,metal rings and the thickness of the phone case do not exceeds 0.11 inch. 【Two Working Modes】 The wireless car phone mount comes with an air vent clip as well as a 3M tape. So you can either put it on the air vent or stick the 3M tape on any place of the dashboard. AYOUYA Wireless charger combines charger and air vent gravity holder, one product, two functions, saving you from a clutter of objects. 【One-hand Operation】 Innovative gravity linkage,easy to lock and release automatically ! Press the clip button on the back and put it on the air vent. Simply slip your phone down, the hand-shaped holder grip your phone securely and charge automatically. Easy installation. No tools needed! Equipped with 360 degree joint ball, which provides you with a variety of optimal viewing angle and enhanced safety while driving. 【Hassle Free Warranty】We promise 2 year warranty and refund policy for every Qi car charger. If our product does not meet your expectations, please feel free to contact us We will try our best to give you a satisfied solution. If you have any questions about this product by AYOUYA, contact us by completing and submitting the form below. If you are looking for a specif part number, please include it with your message.